President Trump threatens North Korea with ‘fire and fury like the world has never seen’, whilst fellow Republican John McCain warns that the country risks ‘extinction’. But what does the regime in North Korea actually want? Is Kim Jong-un truly the mad cartoon villain that the media love to portray? Without being an apologist for the oppressive North Korean government, T. J. Coles exposes the propaganda war waged against it, revealing the truth behind the simplistic news headlines. North Korea has made multiple offers to the international community to end its nuclear programme in exchange for assurances that it won’t be attacked by the US. It has even committed to a no-first-use policy for nuclear weapons – something the US itself will not do. Far from being a state in self-imposed hermitage, North Korea has diplomatic relations with over one hundred countries. It is the US, argues Coles, that deliberately seeks to isolate the regime as part of its wider geostrategic goals in the Asia Pacific. The US’s real target, and ultimately its biggest challenge, is China. Coles debunks myths regarding North Korea’s military and demonstrates that in actual fact it has limited capabilities. In building up its own armed forces in the region (the so-called Asia Pivot), the US is playing a dangerous game of nuclear brinkmanship. 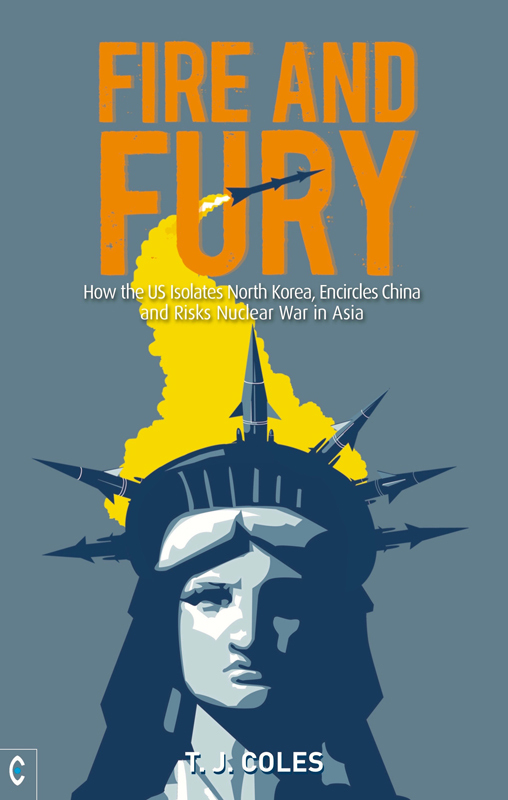 Fire and Fury provides a sharp, succinct briefing for anyone seeking a broader, less distorted and more balanced understanding of current events, whilst offering solutions for ordinary citizens who wish to further the cause of peace. T. J. COLES was awarded a PhD for work on the aesthetic experiences of blind and visually impaired people. His thesis, The Knotweed Factor, draws on the philosophy underpinning cognitive psychology and neurological approaches to blindness. (It can be read online.) A columnist with Axis of Logic, Coles has written a number of political books, including Britain’s Secret Wars, The Great Brexit Swindle, President Trump, Inc. and edited the anthology Voices for Peace. He was shortlisted for the Martha Gellhorn Prize (2013) for a series of articles about Libya.